On Saturday, we hopped in the car and drove through the countryside all the way to Rathwood in Tullow, Co. Carlow. 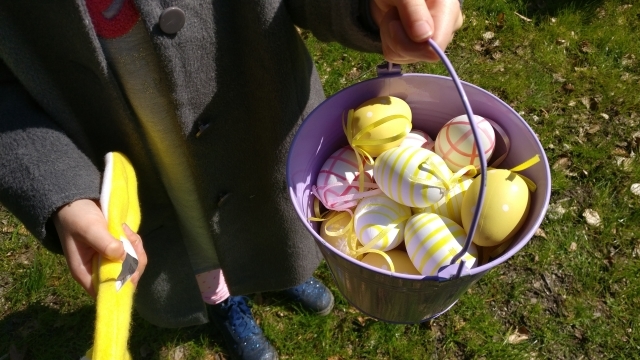 We were invited to visit the Easter Bunny and his friends there and to take a train ride through the forest on an egg-hunt. Even though it's barely over the border into the county next to ours, it took an hour and 20 minutes to get there. Who knew our county was so big! Luckily it was a gorgeous sunny day and we really enjoyed the drive through all the little towns in Wicklow we rarely visit. We arrived a little later than the recommended 20 minutes before our slot (we took a wrong turn), and felt slightly guilty, but very grateful, as we were ushered to the top of the queue and hurried out to join our group, which was lead by an energetic young woman in a Sherlock Holmes outfit. 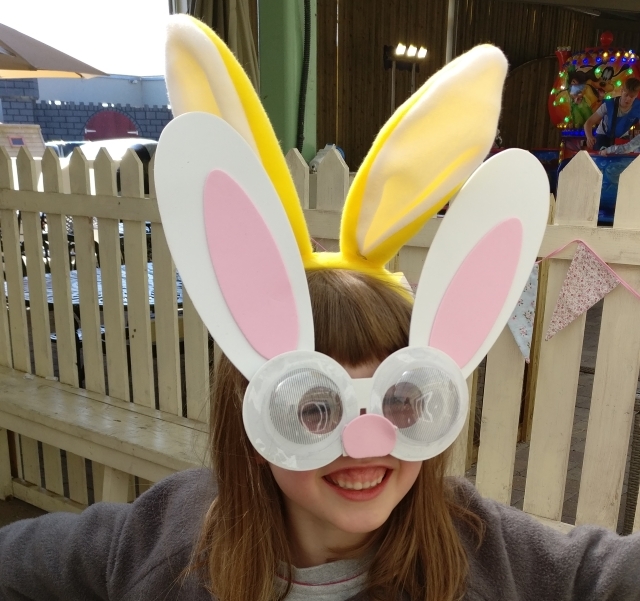 First the children were given a craft kit and had a chance to make some bunny glasses - to help them see better so that they could find the eggs on the egg hunt! My girls love to make things so they got stuck in immediately and were pleased with the results. There was plenty of singing encouraged on the train journey and our guide was great at keeping the story going as she braved the perils of Goose Island, brought us on an egg hunt through the forest and into the barn where we fed the eggs we collected into a giant egg-processing machine. 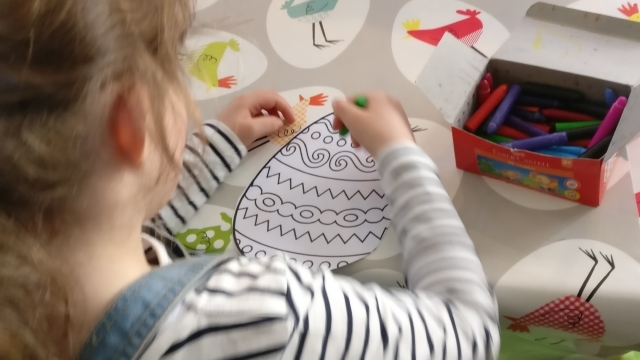 There was time to colour-in some paper-eggs too and lots of fun gadgets to explore. 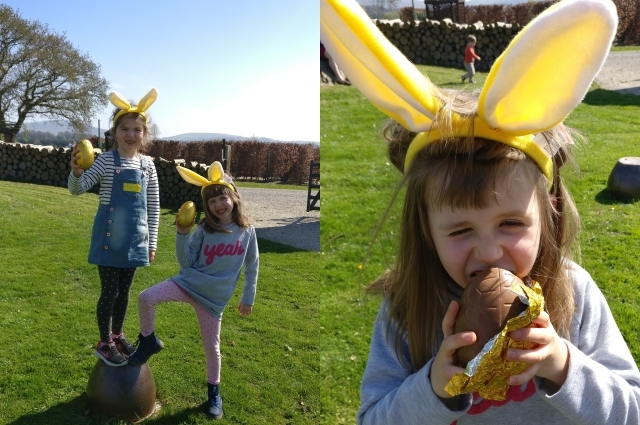 After that we got back on the train, did another small egg hunt and this time got to exchange the plastic eggs we found for a gold-wrapped chocolate egg from the Easter Bunny himself. Although there were times when we couldn't quite hear what the actors were saying they did a great job of keeping everyone on track. Afterwards, we went to the cafe for the free hot-chocolates for the children that came with the ticket. They had an unbelievable cake display so I couldn't resist treating myself too. The event itself lasted roughly an hour. It was very well organised and paced perfectly for the attention spans of little children. You could easily get several hours out of the trip, however, as there is a lot more to Rathwood than the train. 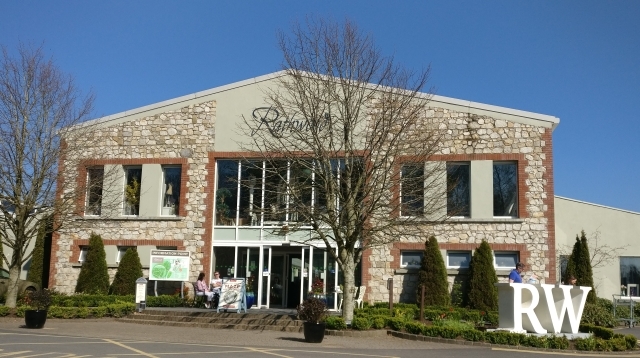 There is a lovely garden centre, a shopping area selling everything from clothes and accessories to furniture and whoever is the buyer for the the toy section and the children's clothes section deserves a pat on the back as they have great taste. There were some fabulous offerings and if the girls hadn't just had their birthday and gotten a ton of new stuff, I would have been sorely tempted... There is also the lovely restaurant with a playground right beside it. Priced at €10 per child (over 12 months) and €6 per adult I think the Rathwood Easter Train event is pretty good value. The price included the craft kit, the bunny ears, an easter egg, a hot-chocolate and the whole train-adventure. All in all we had a very enjoyable afternoon, though my girls at just-seven felt that they were "a tiny bit too big" for the event. They thought it would be most-perfect for four and five year olds but that, at the ripe-old age of seven, they were too old to be posing for photos with people dressed up as bunnies... (they preferred to pose by an upturned flowerpot...) That said, they took part enthusiastically in all of the activities and had zero complaints so maybe they're not as 'big' as they think! 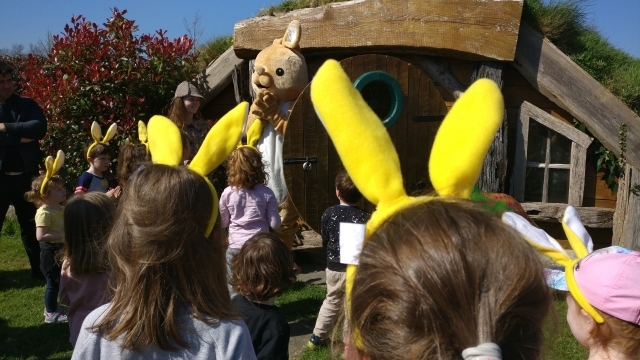 The Easter Train at Rathwood runs from the 8th April until the 16th and is a great family-friendly activity to celebrate the season - especially if you have little ones. Click HERE for more information. Disclosure: We were invited to try out the Rathwood Easter Train experience in exchange for a review. We were not compensated in any other way and all opinions are our own. Thanks Rathwood!